Boys and Girls Clubs across Canada (BGCC) have a positive life changing impact on children, youth and families. 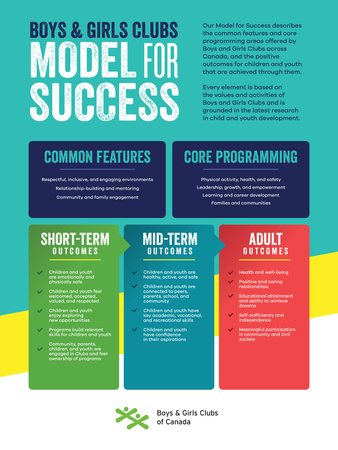 The Models for Success outcomes measurement model enables Clubs to increase the quality and value of programs for children, youth and families and have the evidence to demonstrate this impact. The model has Short, Mid, and Adult outcomes. Developed by Boys and Girls Clubs of Canada it highlights the common features and core programming areas offered by Clubs, and the positive outcomes for children and youth that are achieved through them. Elements are grounded by the latest research in child & youth development, and Club Core Values. Programs enhance young people’s physical & mental health & well-being, mitigate poverty, enhance educational outcomes, & help set children & youth on the track to success! The Club uses evaluation tools to collect information such as assessment tools (listed below), surveys, face to face meetings. Evaluations offer feedback from the lens of children, youth, families, partners etc. and assist with the development of future plans/ improvements. The Club strives to incorporate the outcomes measurement model into training and the evaluation process to promote impacts and outcomes achieved.